X-ACTO Self Healing Mats are a unique accessory that is a must-have for hobbyists and designers who frequently use X-ACTO knives and cutting tools. These cutting mats feature a special surface material which allows them to absorb cuts from a sharp knife or cutting tool and then magically retain their original surface. You wont even be able to find the cut! 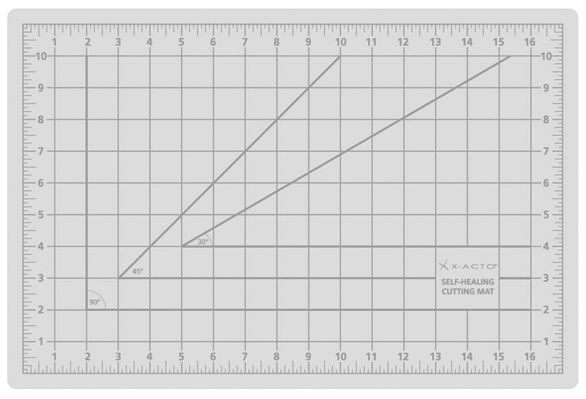 12 Inch x 18 Inch, Grey (Opaque) X-ACTO Self Healing Mats are a unique accessory that is a must-have for hobbyists and designers who frequently use X-ACTO knives and cutting tools. These cutting mats feature a special surface material which allows them to absorb cuts from a sharp knife or cutting tool and then magically retain their original surface. You wont even be able to find the cut!